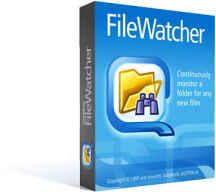 FileWatcher is here, and has many new time-saving features to help you work smarter. Fixed long paths being word-wrapped and not handled correctly. Now prunes the log when it gets too long. As always, File Watcher will read settings files from ALL old versions without any changes being required. PATH. Existing settings will be loaded correctly. e.g. USERNAME, ProgramData, PUBLIC, TEMP, COMPUTERNAME etc. Now can customize the polling interval - previously was fixed at 60 seconds. files can examine and use these values. access to a monitored file. Dual x32 and x64 release. Fixed bug where Browse for Folder did not handle Unicode characters. Fixed bug in file processing that could make File Watcher hang. Better validation error messages for missing 'No Files Command'. FTP poller now supports subfolders. Log file now copes with Unicode filenames. List file now copes with Unicode filenames. items and on newly create files when the folder re-appears. current folder or the Windows Path. Changed FTP to use PASSIVE mode semantics by default. Server detection now excludes Windows Home Server. Fixed 'error cracking url' with FTP locations. Fixed wildcard processing with FTP locations - previously only *. * worked. Action, Network/Polling and Live Log now support Unicode filenames. any further files would not be processed at all. Removed automatic fixup of "%FILE%" - this is no longer needed or desirable. Better cleanup on exit when Actions are still running. Fixed help file not starting. Fixed email support option in evaluation not working. Fixed bug - NoFiles timer was enabling itself even when disabled. NoFiles command is now validated to ensure it exists. New %EXT% macro to insert the file extension. Changed %NAME% to %FILENAME%, added %NAME% for just the name (no extension). New [Test] button to test your action script. New ability to run a command if no files arrives in a given timeframe (e.g. is an executable file you can run it. New HTML Help file - searchable, more info. Fixed working dirs for start menu short cuts. Fixed detection of change on 2 checkboxes. Sample .fwx copied on first run. hence they never matched the wildcards. %PATH% now can be used to specify the path of the triggering file. More internal changes to support Unicode filenames. Fixed bug with wildcards not matching unless set to *.*. Better error messages when data such as the Command to Run is missing. folders' is unchecked - this prevents File Watcher checking them forever. New 'Notes' field for recording information about the settings. Polling of FTP locations now supported. the remote system does not implement the file event API correctly). Now handles log files that don't have a full path specified. Fixed double-click of settings file under Vista, W7. Now logs more useful error messages when a command line fails. New %NAME% option to insert the filename without the path. New option to log to file. New option to ignore folder changes. however this has caused more confusion than it was worth! Now can cope with (fairly rare) filenames with leading spaces. has dropped out and automatically reconnects (it checks every 60 seconds). Now records the exit code of each process. processes all files together once the minimum time threshold has been passed. Previously these files would be processed separately. Files are now processed in order of arrival. Fixed bug with program crashing after trigger. Now excludes the list file from files that are being monitored. Now adds a timestamp to each log line. Now tests the exclusive lock with a Read test, not a Read/Write test. New option to wait for exclusive file lock before processing a file. New debug message to show when files have not completely written to disk. New Help File with many examples, and improved GUI. /HIDDEN now hides to the icon area, and /MINIMIZE just minimizes. Now minimizes to task bar. Added the ability to watch updated and deleted files as well. Fixed help file (readme.txt) not being shown from Help menu. Each running thread now shows a unique process id. GUI now detects changes properly. Can now specify the file types to watch e.g. *.txt. Can now specify multiple folders to watch. Added Manifest XML file for Vista, and fixed HTML Help error on exit. Removed warning message when multiple copies are run. Help file was not opening - bug fixed. Now includes help file, and /F= and /G command line options. Now checks if watched folder exists before starting. Program name and command line are now in two separate fields.